Jacinta Dimase Management - Literary Agent: Radio Rescue! Jim and his family live happily on their remote outback station. Yet, sometimes Jim feels lonely. Jim’s Dad enjoys droving and shearing his sheep but sometimes he wishes he could chat to a mate. Jim’s Mum is always busy with the accounts and looking after the chooks, but she sometimes worries about being so far away from everything—what would happen if someone got sick? Then a strange new radio with pedals arrives and Jim’s Mum and Dad can send messages to their neighbours. Jim wants to have a go! ‘When you’re older,’ says Dad. Then something happens that only Jim can deal with. Will he learn how to use the radio in time to save Dad? Radio Rescue! is a beautifully illustrated flap book that takes us back to the origins of communication in the outback. 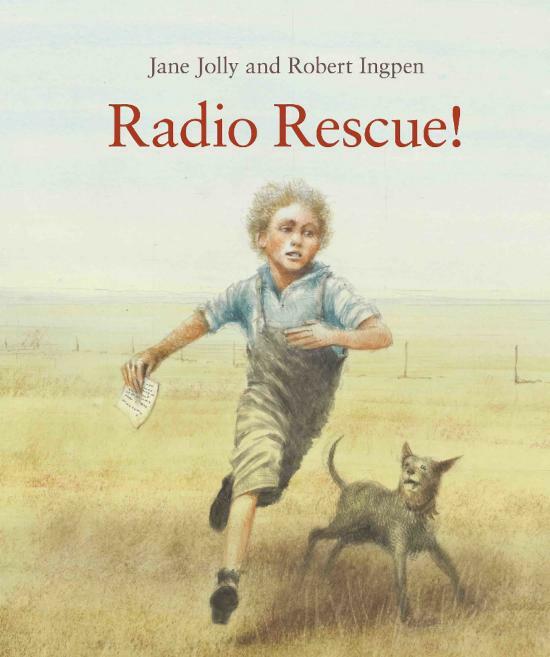 Robert Ingpen’s illustrations evoke scenes of station life and convey Jim’s excitement at the arrival of the new pedal radio. The flaps with their wonderful pencil sketches of the characters open up to reveal rich colour scenes. Fascinating factual information at the back of the book explains how the pedal radio worked and how the Flying Doctor and the School of the Air developed as a result. A sister book to the award-winning Tea and Sugar Christmas, with the same author and illustrator.